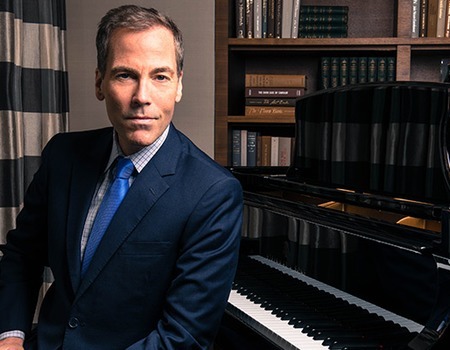 Veteran entertainment personality and author, Nelson Aspen, makes his West End cabaret debut at Crazy Coqs with his new show, Just in Time. Just in Time traces Aspen's musical path through various genres as he carved out his unique niche in the showbiz community. He began a 25 year career in breakfast television with This Morning with Judy and Richard before moving on to long stints with GMTV and Lorraine Kelly. Since 2003, Aspen has served as the Entertainment Editor for Australia's #1 Morning programme, Sunrise and recently received his third nomination as the Publicist's Guild International Media Journalist of the Year. "And it all started by being commissioned to train Princess Diana in that 'hot new workout of 1990' Step Aerobics" he laughs. But that's a yarn he'll save for the stage! With humor and expert storytelling skills, Aspen shares songs and stories everyone will recognise from their own pop culture experiences. Just in Time follows up his popular Full Circle show from 2015/16, which included appearances by Anita Gillette, Shelly Burch, Deven Green, Monica Horan, Ilene Kristen and other stage/screen stars. You never know what famous faces might turn up onstage or in the audience when Aspen performs. Aspen's scheduled special guest star will be acclaimed British mezzo soprano and 2018 BRIT Award nominee, Carly Paoli. Having duetted with Andrea Bocelli and Jose Carreras, Paoli has performed all over the world for everyone from HRH The Prince of Wales to Pope Francis. With Aspen, she'll show off her more lighthearted musical side with all the power and talent that make her one of today's most exciting classical stars. Musical Direction by Mitchell Kaplan, with Jerome Davies on bass, and Jeff Lardner on drums.